The Developers, Berkeley Homes of Kent, proposed a plan for the site which they hoped, would appeal to the Hermitage Campaigners, but found that their offer to construct a Development that included an Exhibition centre and Gallery at the Western end with Housing in the middle plus a small Memorial Park on the east side, did not meet with local campaigners approval, their demand was for the whole site being turned over for the use of a War Memorial and Public garden, the land should not be lost to yet another luxury development along the Thames. showing a third of the area to be used to construct 'quality' flats, 40% for a Memorial Park and the rest for a Gallery and exhibition Centre, the Architect responded to local people to incorporate one of their prime demands, a plan with environmental and Tourist considerations in its design. 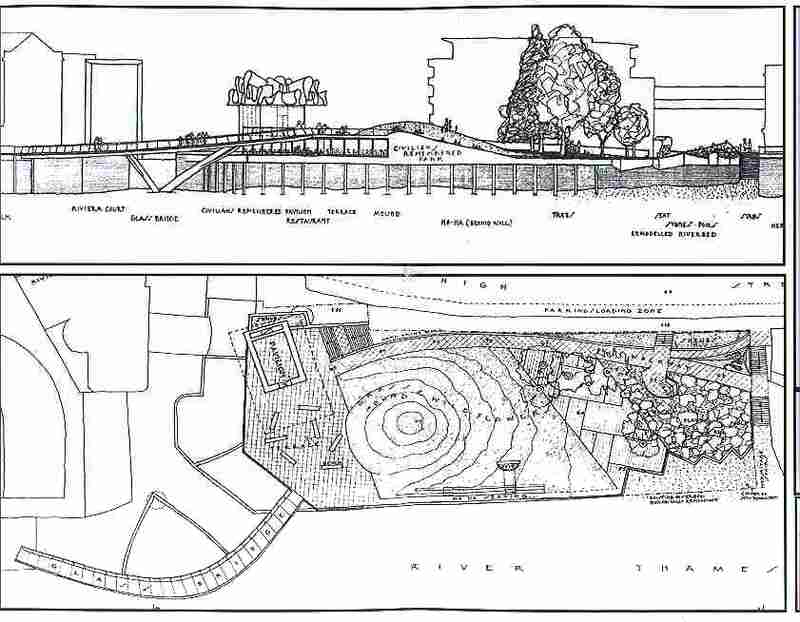 an extended Walkway along the River is shown below, and a direct link to the Tower of London with riverfront views, plus Public space and a possible jetty, but organisers of 'Civilians Remembered' had set their sights on demanding nothing less than the whole site for their Memorial plan.